Having a messaging service that allows us to share unlimited content freely is bliss nowadays. And Apple has provided one such service which is known as iMessage. 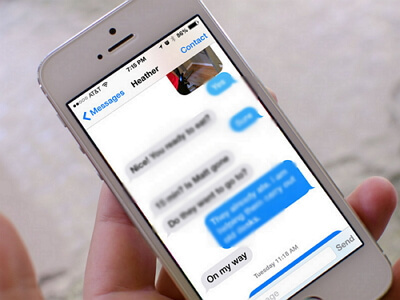 People use iMessage to exchange various types of data like photos, texts, audio messages and more. But we should always consider the worst case scenario, shouldn't we? What if you accidentally delete your important iMessages and later you repent because you need it at that moment? You shouldn't worry about this situation. We have something to share with you so that whenever such instance occurs, you can simply read this article and go for iMessages recovery. So, without talking much, let's discuss what should you do for iMessages recovery. 1. Why You Can Recover iMessages Directly from iPhone? 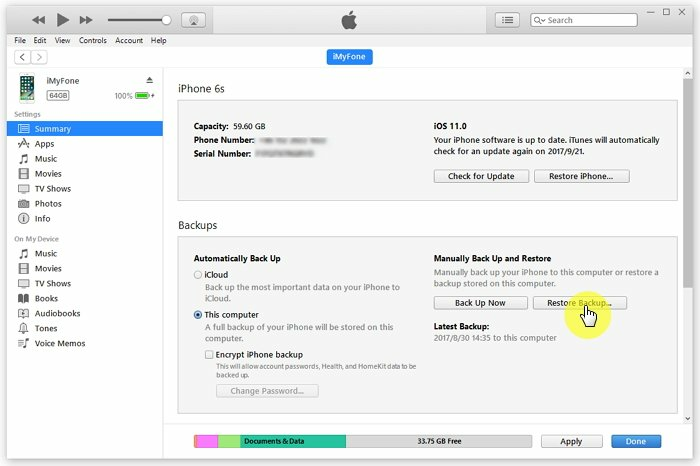 If you never or seldomly backup your iPhone, you must read this part carefully because this solution is designed for those who have no iTunes or iCloud backup. 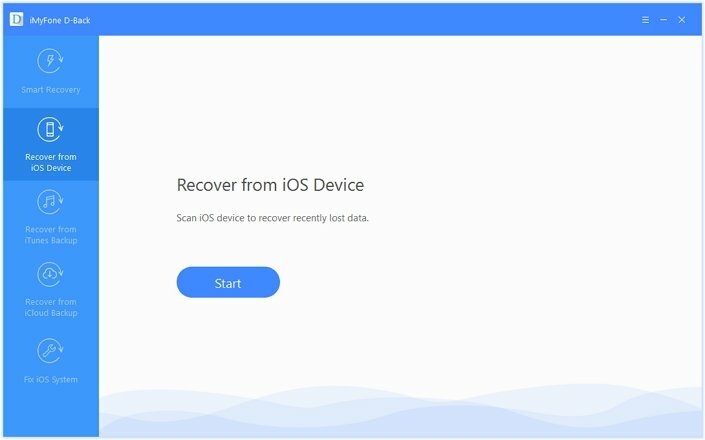 In another word, you can recover your deleted or lost iMessages from your iPhone without any backup. Why You Can Recover iMessages Directly from iPhone? Before we move for iMessages recovery, it is essential to know what makes this possible and why you can recover your iMessgaes from your device directly. Here is why. Well! It's no less than a 'hide & seek' game. Let's cut to the chase, iPhone works with SQLite database technology where it stores the data location. When you delete something or it gets accidentally deleted, that location converts from 'Allocated' to 'Unallocated' and the deleted data hides somewhere in the device thereby making the space for the new data types. Hence, there is a chance to retrieve the deleted data back. However, for best results, you need to take actions as soon as possible. Unless and until the new data gets entered in your device, you can always get the deleted data back. 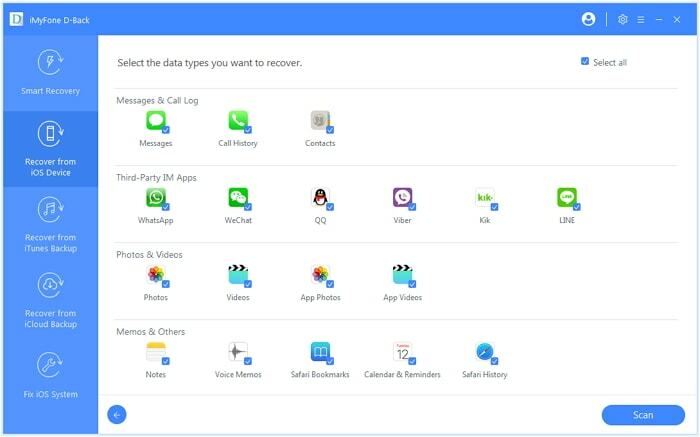 Considering this, it is advisable to stop using the device right away when you realize data loss situation to avoid overwriting of data and then using a highly reliable tool, recover the data. Now, we would like to reveal the tool that we strongly recommend for iMessages recovery. It is iMyFone D-Back that holds the capability of recovering iMessages and other numerous types of data with ease and within no time. You can use this highly professional and trustworthy tool to recover data that is lost due to any circumstance. 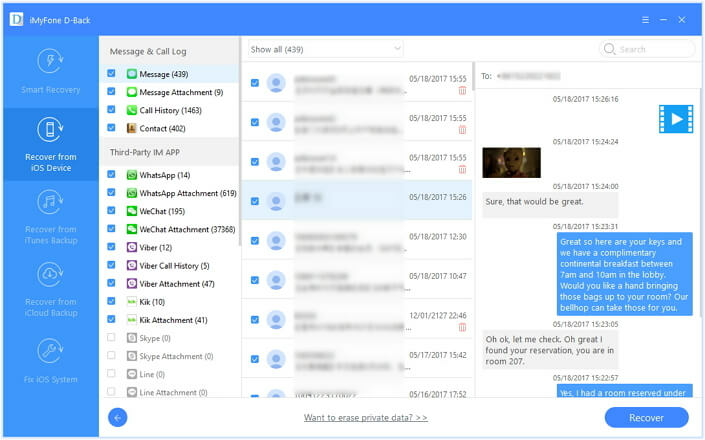 Putting in other words, no matter your iMessages had lost due to software malfunction or accidental deletion, you can retrieve them in hassle-free way. Just download the free tool now and follow the step-by-step tutorial below for iMessage recovery without any delay. Step 1 – Begin with getting into the official website of D-Back and download it from there. Install and launch later. Once launched successfully, click on 'Recover from iOS Device' from the left panel followed by 'Start'. Step 2 – Connect your iPhone to the PC now and then click on 'Next' when your device is completely detected by the program. From the next screen thereupon, you need to select the data types that you want to recover. After selecting, click on the 'Scan' button. Step 3 – Now the next screen will allow you the privilege to get your data previewed before recovering it. From the let panel, you can choose the data type i.e. messages and then preview them on the main screen. Click on 'Recover' in the last when you are done previewing the data. This is how iMessages recovery is done through iMyFone D-Back. There are also many iPhone users who have the habit to backup iPhone frequently in order to avoid any data loss. If this is your case, you can use the methods below to recover your iMessages. What you have to know is that the existing data on your device will be overwritten. You have to get active and stable network connection if you restore iPhone from iCloud backup. The steps are a little complicated, so make sure you have enough battery and enough spare time before starting. You can also execute iMessages recovery when you have made an iCloud backup before. Here are the steps to perform iMessages recovery from iCloud backup. Step 1 – Firstly, you need to get your device send to the setup phase again. For this, you are supposed to factory reset it. Open 'Settings' and tap 'General' > 'Reset' > 'Erase All Contents and Settings'. Step 2 – When you're done with erasing the data from your iPhone, it will start rebooting on its own. After when it's rebooted, you need to setup your iPhone. While setting it up, reach to the 'Apps & Data' section and from there, pick out 'Restore from iCloud Backup' option. Step 3 – Subsequently, go for signing in to the iCloud account using the valid iCloud credentials. You will receive the backup list now. It's time to opt for the preferred backup file and then restore it. A yet another for iMessages recovery is iTunes. People usually take backup of their data through iTunes and we are assuming that you have done that too earlier. Follow the steps below if you have an iTunes backup. Step 1 – With the help of an original lightening cable, get your iPhone connected with the computer. Once done with the connection, run iTunes and get to its main screen. Step 2 – Hit on the Device icon located at the top left and then you will need to click the 'Summary' panel. 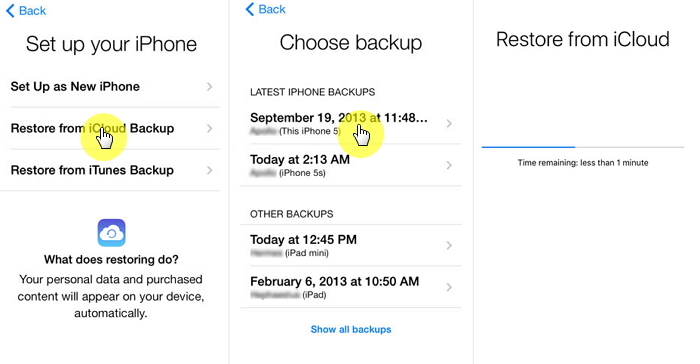 Step 3 – After this, look for the 'backups' section and from there, just click on 'Restore Backup' button. Now, from the next pop-up window, go for the backup you want and press 'Restore' to confirm iMessages recovery.